This blog is part of a complete Excel VBA tutorial. You can also learn to program in VBA on one of our VBA macros courses. There comes a magical moment in every Excel Visual Basic programmer's life when he - or she - suddenly realises just how wide their horizons are. Which is a poetic way of saying: VBA isn't limited just to Excel! Wouldn't it be great if you could (say) copy information from Excel into a Word document programmatically? However, the following diagram proves this isn't possible - doesn't it? If you could create a reference to Microsoft Word from within Excel, it would be included in this list. Wouldn't it? Here we somehow have made available the Word object library within Excel - the rest of this blog shows how to do this, and how to use the resulting reference. Word Microsoft Word has unpredictable VBA, but its saving grace is that you can record macros in Word, just like in Excel. PowerPoint You can program presentations and slides in PowerPoint VBA, but from version 2007 onwards you can no longer record macros. Access I've written a separate blog showing how to add, edit, delete and list records and fields in an Access database from within Excel. SharePoint SharePoint Designer supports VBA (although as for PowerPoint and Access, you can't record macros). Outlook You can write macros within Excel to manipulate mail messages and contacts held in Outlook. This is just a tiny selection of the applications which support VBA (the technical phrase is that they support the Component Object Model). 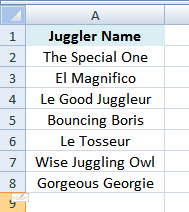 Initially we'll have a list of jugglers in an Excel worksheet. 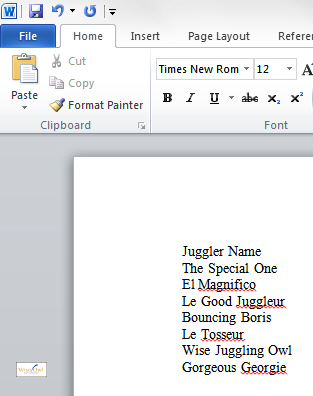 The end result of running the macro we'll write: a list of the jugglers in Word. Clearly we could have done something more exciting with them, like creating a table or chart. And with all that preamble out of the way - let's begin by creating a reference to Word. I have one query regarding add references in VBA. I know that if I want to add/use objects and properties for any application then I add the reference. But I don't understand which library I should use, and how I can find it to get object/properties?. For example if I want to use another application (like VLC media player or Google chrome), which support automation then how do I found the library file for them? 'make sure you can see it on screen! Sadly, when I run it it doesn't actually work! Although it compiles and runs perfectly, no VLC window opens. I'm not sure what I've missed out, but the principle shown is good. ChromePath = "C:\Program Files (x86)\Google\Chrome\Application\chrome.exe"
Note that you don't need to create a reference for this, as you're not using an object library. The only way round this that I know is to use a third-party add-in like Selenium, which will allow you to automate browsers from VBA.